Posted by ronannarbor in Detroit, Entertainment, Michigan, Shakespeare, Theatre, Travel. But today I am writing as Vice Chair of the Board of Directors for the Michigan Shakespeare Festival. When I first moved to Michigan from NYC, I came across this small outdoor theatre festival in Jackson, Michigan that performed outstanding Shakespeare productions in the park — and from the first show I saw I was hooked. The Festival has since grown tremendously in scope and nature, has for many years been located indoors in state-of-the-art, air-conditioned, bug-free splendor, and has continued to present remarkable theatre for five weeks every summer. This year, the Festival is expanding to include three weeks in Canton, MI as well! We know that many of our audience members travel to Jackson from the SE Michigan area, and now we are pleased to be in our own backyard, centrally located in Canton. We don’t ever plan to leave Jackson, but its an exciting expansion into Wayne county which is more convenient for Detroiters and Ann Arborites. The Michigan Shakespeare Festival is a professional Actors Equity Association-LORT theatre festival, featuring all-professional actors, artistic staff, and technicians. Everyone gets paid a living wage — except for us Board Members of course. Because the Festival maintains high artistic professional standards that result in top quality productions utilizing artists of the highest caliber, it is no wonder that the company is the most award-winning theatre in the state, garnering not only local but national acclaim. Reviews called last season’s productions “Outstanding” (MLive), “You may never again see this play done so well” (Encore Michigan), “Remarkably relevant” (Examiner), “Four out of Four stars” (Detroit Free Press), and “Exquisite…gorgeous…perfect” (Jackson Citizen Patriot). BroadwayWorld named last season’s production of Hamlet the Best Shakespearean Production of 2014. The Michigan Shakespeare Festival has also been named the “Official Shakespeare Festival” by the State of Michigan. If you have never attended — you should. Its kind of a big deal. Come see why the shows win all those Wilde Awards every year. If you have, then you already know that the festival regularly gets visitors from all over Michigan, Ohio, Indiana, Chicago, and Canada…its destination theater year after year. This July 9- August 16, 2015 the Festival will offer William Shakespeare’s A Midsummer Night’s Dream and both parts of Henry IV, along with Richard Brinsley Sheridan’s The Rivals, at both venues — in Jackson and in Canton. Tickets are now on-sale. Tickets are available at all sorts of price points — with special reduced preview performances, and other deals. Group sales are also available. But as you know, (and this that part of the post where owning your own blog comes in handy once a year), ticket sales make up a very small proportion of the monies required to keep a professional theater company up and running. We depend on our sponsors, theatre patrons, and you to make it all happen summer after summer. We’re not talking outdoor-theatre-in-the-park anymore —- we’re talking something that rivals every other professional Shakespeare Festival company nationwide (and that other big festival in Ontario). If you can, won’t you please take a moment to remember the Michigan Shakespeare Festival with a donation or sponsorship? It’s easy. Just make out a check to the Michigan Shakespeare Festival and mail it to the address below, or call the phone number, or donate online. There are all sorts of sponsorship packages available — from program ads to sponsoring almost every aspect of the shows and festival itself. What a great way to get your name affiliated with something pretty cool and hip. I’m proud to say that my company BrainTrainers is a sponsor of the Festival as well. We’ll thank you, we’ll applaud you, we’ll salute you with another season of awesome Shakespeare. And you’ll know that you made the difference. Thanks in advance — hope to see you at our shows this summer! Posted by ronannarbor in Broadway Musicals, Broadway Tour, Detroit, Entertainment, musical theater, Musicals, Theatre. 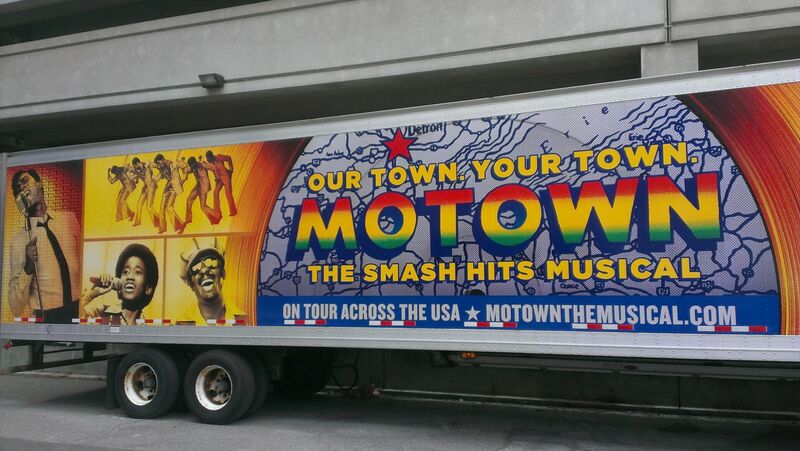 Let me preface this by saying that I host a radio show called “From Memphis to Motown” Saturday afternoons from 1-4pm on 89.1 WEMU, and thus I’m predisposed to love a show called Motown: The Musical. For me the original “Happy” music came from Motown. When I hear songs like Ain’t No Mountain High Enough and I Heard It through the Grapevine it makes me want to move. And I did love it…for the most part. Spanning 45 years and covering 60 songs, almost all well known classics, Motown: The Musical is a lightning paced confection that is loosely held together by a narrative that traces the lifespan of Motown Records and its founder Berry Gordy. For those uninitiated, Motown: The Musical is what is called a Broadway jukebox musical which means it’s all about the songs. The book by Berry Gordy, based on his 1994 autobiography To Be Loved: The Music, the Magic, the Memories of Motown, chronicles his personal and professional relationships with Motown artists such as Diana Ross, Smokey Robinson, Marvin Gaye, and Michael Jackson. As I was leaving the theater, I overheard someone say the story was different than they had heard before. And that might be the problem. The relationships, many of which have been well documented, seem sanitized, or at the very least glossed over. What is left is a slick, well oiled machine, which is probably not far removed from the “music factory” which was Motown. On this particular afternoon one of the two actors understudying the role of Berry Gordy went on and no one missed a beat. In fact, all of the major roles had two understudies, probably because this may be the hardest working cast in show business. With the exception of the actors playing Gordy, Diana Ross, Smokey Robinson and Marvin Gaye, all the other performers (with the exception of the young man playing Michael Jackson, et al) are credited as ensemble. Don’t let that fool you. This is a cast of powerhouse performers. Despite playing as many as five roles (with multiple costume changes), each actor gets their moment to shine. Stand outs include Elijah Ahmad Lewis as the adult Stevie Wonder, who garnered a standing ovation mid-show and Krisha Marcano as Florence Ballard. Of the leads, Nicholas Christopher as Smokey Robinson and Jarran Muse as Marvin Gaye were particularly effective. Allison Semmes as Diana Ross had some nice moments as the aloof star, but struggled with the younger version of the diva. Jamarice Daughtry stepped into the shoes of Gordy as an understudy gracefully. Leon Outlaw, Jr as the young versions of Berry Gordy, Stevie Wonder and Michael Jackson is a child prodigy that should be dissected and studied, he was so spot on. Posted by ronannarbor in Detroit, Theatre. There’s a terrific production of the uneven 2013 Tony Winner for Best Play, Vanya and Sonia and Masha and Spike by Christopher Durang, on display at The Tipping Point theater in Northville — and it is an actors paradise — though it helps if the audience is in on their theater-gossip and references. Originally opening at Lincoln Center Theater and transferring to Broadway at the Golden Theater, the show went on to generally win accolades in a not-very-strong 2013 theater season, including the “big” awards for best play. Christopher Durang’s rants and raves about contemporary culture and progress sound like something written by someone in their mid-80’s not their mid-60’s…none-the-less there is more good than bad in the show, and the best is on display in this production, the first (but not last) local presentation of the comedy. It lends itself to community theater and expect every single theater around the area to do it over the coming years as it gets its amateur release following a round of regional professional productions. To make a long story short despite its lofty Chekhovian namesakes, its a pretty thin story: brother and sister Vanya and Sonia have been living in the house in which they grew up after tending to their aging and now dead parents in a state of inaction, ennui, and depression. Along comes a surprise visit by their successful actress sister Masha (who has been paying the mortgage) and her much younger beau Spike. Throw in a cleaning woman who fancies herself a modern-day Madame Arcati and a naive attractive neighborhood girl and hilarity ensues when Masha desides she needs to sell the house. And that is about it — but theater and actor references get thrown out as quickly as they can be mustered up and nobody is safe from the onslaught — not Lindsay Lohan, not Disney, and not a dozen others. John Seibert plays David Hyde Pierce, um sorry, Vanya, and he’s terrific, especially in his big scene near the end of Act 2. Janet Maylie absolutely nails Sigourney Weaver, um sorry again, Masha. Terry Heck underplays the part of sister Sonia, and its more moving here than it was on Broadway, though it misses the over-the-top ethereal quality Kristine Nielsen brought to the original production. Sonja Marquis plays a terrific Cassandra, and her voodoo sequence steals the show. Brian Thibault plays mostly underwear-clad Spike, and Tara Tomcsik rounds out the cast in the underwritten role of Nina. This is an all around exceptional cast of versatile actors, and they do very good work here in Tipping Point’s production. Well directed and beautifully paced by director James R. Kuhl the production moves swiftly from vignette to vignette, and the show comes in at 2:15 including the intermission. Monika Essen’s beautiful Bucks County house works well in the small space, and there is good costume work by Shelby Newport, and lighting by Alex Gay. Posted by ronannarbor in Detroit, Entertainment, musical theater, Musicals. The Dio – Dining and Entertainment, Livingston County’s professional dinner theatre, announces auditions for their upcoming production of the original musical, “Country Roads, A Musical Journey” by Leslie Jo Hood directed by Steve DeBruyne, music direction by Brian E Buckner, and choreography by Cara Manor. Auditions will take place on Sunday, January 12 from 3pm to 6pm at The Dio. The theatre will open at 2:30pm. Anyone wishing to audition must be signed in by 5:30pm. Callbacks will take place the same day at 6pm and will consist of a short movement combination and cold reading from the script. Note that not all actors will be required to attend all portions of the callback. Please prepare to sing one of the songs listed in the character descriptions. If you play guitar, please bring it with you and prepare to play a short country style tune. No need to bring sheet music for the accompanist if you are singing one of the songs listed below, but please bring a headshot and resume STAPLED TOGETHER as well as a list of any rehearsal/performance conflicts you may have. Jimmy’s record shop, Country Roads, “Where stars are made”, is the Nashville hot spot for aspiring artists. Not only does Jimmy sell some of the best albums, he features new singers in live performances at the shop! But when a new shop opens, and copies his model, will Jimmy be able to stay afloat, and finally realize his dream of signing a record contract of his own? Along with his pal, up and coming country star Patsy, Jimmy faces some tough questions, while singing some of the best country music ever written! Featuring over 40 of your favorite country tunes, “Country Roads” is sure to keep your toes tapping! The owner of Country Roads Record Shop, and Patsy’s best friend. Plays the song “Country Roads” on guitar. To audition for this role, please sing “Country Roads” by John Denver. A young, up and coming country star named after the movie star…her parents had a different path in mind for her. Experience with the guitar is a plus for this role. To audition for this role, please prepare to sing “American Heart by Faith Hill. Sing many songs and play lots of characters including country legends Ernest Tubbs and Hank Williams as well as a quirky tourist visiting the shop, among many others. Please prepare to sing one of the following songs: One More Last Chance (Vince Gill), If Tomorrow Never Comes (Garth Brooks), Lovesick Blues (Hank Williams) or Walking The Floor Over You (Ernest Tubb). Sing many songs and play lots of characters including Loretta Lynn and Minnie Pearl, among many others. Please prepare to sing one of the following songs: You Ain’t Woman Enough (Loretta Lynn), Sleeping Single in a Double Bed (Barbra Mandrell) or Redneck Woman (Gretchen Wilson). Rehearsals will begin on March 3, Mondays through Fridays, 6pm to 10pm, and Saturdays noon to 6pm. Tech will take place 10am to 10pm on Saturday, March 29. Performances take place April 3 through May 11, Friday and Saturday evenings, and Sunday afternoons. There will be one Thursday matinee on May 8. No performance on Easter Sunday, April 20. Performers unable to attend this audition may email their headshots and resumes to steve@diotheatre.com. Include links to video of previous performances if possible. Posted by ronannarbor in Ann Arbor, Broadway Musicals, Broadway Tour, Community Theater, Detroit, Entertainment, musical theater, Musicals, Theatre. The Best overall community theater production this past year was: GREY GARDENS at Ann Arbor Civic Theater. Special kudos to Kathy Waugh for her terrific performance. The Best summer theater production was: SEVEN BRIDES FOR SEVEN BROTHERS at Croswell Opera House. Its been a long long time since Croswell had such a dance-tacular production, thanks to the Hissong’s direction and choreography. The Best summer theater production that was indistinguishable from a Broadway Tour: AVENUE Q at Croswell Opera House. It was so good, it was hard to even compare it to other local productions, it had to be held to professional Broadway tour standards — and it was as good as, if not better, than the tour that came through Michigan a few years ago. Speaking of tours: The best Broadway Tour to come through Detroit was: JEKYLL & HYDE — Broadway Bound with a spectacular Tobin Ost set, and a remarkable performance by Constantine Maroulis. The best Broadway Tour to come through Wharton Center in East Lansing was: ANYTHING GOES, with a touring cast led by Rachel York that was stronger than the Original Broadway cast. The best local university musical was: CHICAGO at the University of Michigan. Although it had strong runners-up in SUNDAY IN THE PARK WITH GEORGE (also at UM) and LEGALLY BLONDE at MSU. Also delicious was SWEENEY TODD at Sienna Heights. Speaking of Legally Blonde: I saw 4 productions of this show, and despite varied levels of good lead performances, it just goes to show that this is a musical that is hard to recreate without a multi-million dollar budget. The Original Broadway production is so deeply visually ingrained (thanks to MTV’s relentless showings a few years ago) that any non-professional production just pales in comparison. One favorite note: in the Croswell production, when the trailer door stuck, David Blackburn hilariously announced “I’ll just use the back door!” and came around from stage left complete with bulldog. It was the biggest laugh of any show I saw this past year. The best small-cast show of the year: THE LAST 5 YEARS at Jackson Symphony Space — Jayna Katz and Adam Woolsey blew the roof off of the place nightly. The best “becoming an annual tradition around here” musical: EVIL DEAD THE MUSICAL at Dexter Community Players. Expanding community theater’s boundaries by squirts and bounds, with a strong cast and twice the splatter-power. I wasn’t impressed much by any of the local professional musical theater productions this year, although there were some mighty fine performances. The Dionysus Theater made a strong debut as a professional theater company with their holiday offering HOME FOR THE HOLIDAYS – right out of the gate hitting all the right notes in a finely performed production in a gorgeous proscenium theater space. A couple shows will go without mention here, because I abhor when major changes are made to Broadway musicals to fit a director’s “vision” or a small budget — but it is worthy to mention the lovely GODSPELL at Encore, where Dan Cooney took a show that has become bloated and almost unwatchable over the years, and turned it into a fresh, sparse, and clown-makeup-free delight. Finally — one “ugly” — the reworked BEAUTY AND THE BEAST arrived at the Stranahan on tour, with a non-equity NETworks production, featuring some of the ugliest costumes and sets I have seen in a Broadway tour. UGH. Take a 10-minute book, turned into a 30 minute tv special, and expand it to a 90-minute intermissionless musical, and you have the plusses and the minuses of the holiday musical “How the Grinch Stole Christmas” which is currently playing multiple times a day at the Detroit Opera House on its holiday tour. There isn’t much critical to say about this production — it looks swell and the costume and set design is colorful and works well. The cast members are covered in loads of makeup and hair design, so they are pretty much interchangeable. I have several friends in this cast, and (honestly) I couldn’t pick them out in the ensemble for quite some time. Though I guess that is what it is. Stefan Karl is an excellent Grinch, and he is clearly having a ball playing his part. He’s surrounded by an energetic cast, singing unremarkable songs, only the original animated tv version songs stand out (and “Your a Mean One Mr. Grinch” follows you home after the show — seriously, I listened to it about three times in the car on the way home and changed my ringtone to the tune)…and the Grinch stealing the presents sequence is brilliant. The first third of the show is slow-going, but what follows is a holiday treat — well written, finely performed, and expertly designed, it’s like holiday cookies and milk. Sugary sweet, check. Lump in the throat, check. Grinch’s heart growing three sizes, check. Yours too. Feeling guilty in enjoying this tasty treat, check. Just to make sure, though, there isn’t any mistaking this production with a typical Broadway show (even though this did run in NYC for several seasons)…it’s a holiday entertainment that is fun for the entire family. And based on this afternoon’s very full (and skewed toward toddlers) audience, families are turning out in droves. Welcome, welcome Christmas Day…fun fluff, you’ll have a fun time. Posted by ronannarbor in Broadway Musicals, Broadway Tour, Detroit, musical theater, Musicals, Theatre. La Cage Aux Folles rolled into town last night, and its a doozy. I saw this revival in NYC two seasons ago, and the tour is every bit as excellent as it was on Broadway. Winner of the tony for best-revival (among other awards) its easy to see the care that has gone into the tour of the show. It’s great to see a tour that has as much crafstmanship go into into it as the original — in fact, except for the slightly larger scale of the sets, its virtually identical. George Hamilton plays Georges (so lovable you can let him get by with really poor vocal ability) and Christopher Sieber steals every scene he is in as Albin, quite an accomplishment following in the footsteps (or high heels?) of tony-winner Douglas Hodge on Broadway. The entire ensemble is exceptional. If you read my earlier review of this revival, you know that the ensemble here is scaled down from the 24 or so in the original to just a handful — and that every one of the “la cage girls” is a hunk. If there is a single thing different about the tour that stands out, it is the intimacy of the theater — on Broadway, the show was so well integrated into the small house that you virtually felt like you were sitting IN the club. The Fisher is a bit less intimate, so the show feels a bit more stage-bound. Some of the touches that made the NYC production so good are all here too — including “curtain/lobby warmer” Ms Lilli Whiteass making jokes, welcoming the crowd, and cracking a few Detroit jokes to the delight of the audience. This “bit” was added well along into the Broadway run, as tourists replaced locals in the audience. Its a great touch that remains fresh and funny on tour. If you have seen La Cage before, you haven’t seen it like this. It deserved every Tony it got — and this tour cast does the show proud. Running now through October 7 at the Fisher Theater, Detroit. So — now that the summer musical theater has pretty much ended in SE Michigan for the year, what was the scorecard? All in all, not a bad summer season for local musical theater. The biggest surprise: the reworked Seven Brides at Croswell. The biggest disappointment: the multiple Legally Blondes, none of which lived up to their full potential (although Marlena Hilderley’s Elle at Croswell was sublime). Also, not reviewed but occurring were the many community theater productions around the area, including Annie at Dexter Community Players; the Anniversary Celebration at Chelsea Area Players; and many many others. Onto the fall local and touring season…Current recommendation: Anything Goes tour at Wharton Center — don’t miss buying your tickets now before they are all gone. Posted by ronannarbor in Detroit, musical theater, Musicals, Theatre. This is a good news-bad news review. Before I go further, let me just say that the very talented cast in Encore’s SMOKEY JOE’S CAFE sings well, dances well, and has stage presence to spare. The set looks great. The lighting right on target. The band sounds great. So what goes wrong? Well…nothing that Encore could do about it, besides maybe pick a better show. I’m not a fan of revues, and that is what Smokey Joe is…two hours of Lieber and Stoller songs in a hodgepodge revue that has no storyline and which resorts to lights-down-lights-up scene changes for transitions. And not all of those songs are good. In fact, many of them are not. It’s all sort of like watching a cruise ship show — no, it’s exactly like watching a cruise ship show — slick; well done; but ultimately unsatisfying as you head out of the theater and back to the ship’s casino. The very talented ensemble cast sing, dance, and work very hard to please. It’s hard to single out any exceptions, so let me just say that the (entirely non-equity) cast is composed of Brian E. Buckner, Steve DeBruyne, Sebastian Gerstner, Cara Manor, Terrence D. Owens, Jr., Fatima Poggi, Thalia Shramm, and Amy Smidebush. Mysteriously missing is the 9th cast member the show is written for. Most of the show glides along just great, with solos, combos and group numbers that feature each cast member individually, as well as in boy and girl groups. Missing is any sense of who these people are, except for very broad strokes that don’t hold as the show progresses. Might as well be variety show numbers following one after the other. I had that same sense after seeing the Broadway production (which inexplicably ran almost 5 years in the 90’s), so it’s not the fault of the hard-working folks at Encore. Some numbers work better than others: “Jailhouse Rock” and “Stand By Me” smolder….while “On Broadway” falls flat, not only because of the over-involved choreography, but also because the vocal mix just doesn’t work (it didn’t work on Broadway either, where it looked like the guys were going to swallow their body mics). But that’s another thing — if ever a show calls out for body mics, it’s Smokey Joe. Soloists here are sometimes overwhelmed by the (offstage) band, and at other times by their own cast mates. They all sound great, and the blend is very good — but you lose the soloists entirely in places. Leo Babcock has designed a dandy set with two sweeping curved staircases. Sharon Larkey Urick’s costumes are serviceable without ever really evoking the 50’s or early 60’s. Matthew Tomich’s lighting design is generally spot on (except in one instance where beautifully spot-lit Steve and Thalia are suddenly aglow in full stage brightness that made my pupils spin). All in all, I would always prefer a book musical (although Encore’s upcoming season of community theater type fare doesn’t make me want to run and buy tickets to any of them), but Smokey Joe’s Cafe is a well-done, well-produced musical revue. In her program note, Barbara F. Cullen states that the show is “so much more than a musical revue”. I beg to differ, and would actually say its the worst kind of musical revue – the type that has nothing but musical numbers and very little heart. That is not to slight this production which is top notch, but exactly what you would expect of a production of this show. Posted by ronannarbor in Broadway Tour, Detroit, Entertainment, musical theater, Musicals. ALLEE WILLIS MARCHES ON DETROIT! WHAT: As a special benefit for MUMFORD HIGH SCHOOL, alumna extraordinaire ALLEE WILLIS conducts the MUMFORD HIGH SCHOOL MARCHING BAND through a medley of her hit songs in the lobby of Detroit’s FOX THEATRE, with cast members from THE COLOR PURPLE joining in for a sing-along. An alumna of Mumford High School, Willis will lead the school’s marching band through a medley of her hit songs in the lobby of the Fox. The Saturday, April 9 event takes place during a weekend run of The Color Purple at the theater, and cast members from the touring company of the Broadway smash—of which Allee is a co-author—will join in for a celebratory sing-along. Event will go toward new band uniforms. The Allee Willis-composed songs comprising the medley—to be played first instrumentally by the marching band, and then with TCP company members singing along—are: “September,” “Boogie Wonderland,” “In The Stone,” (all major hits for Earth, Wind, & Fire), “I’ll Be There For You” (Theme from Friends),” “The Color Purple,” “Stir It Up” (Patti LaBelle), and “Neutron Dance” (the Pointer Sisters). The last two songs connect Allee to Mumford beyond her having gone there—they’re featured in Beverly Hills Cop, and on the soundtrack, which won Allee a GRAMMY. The film, produced by fellow Mumford alum Jerry Bruckheimer, made the school famous when Eddie Murphy wore a Mumford t-shirt throughout. Allee was inspired to work with the Mumford High marching band after being invited to conduct the 350-piece marching band at her collegiate alma mater, University of Wisconsin, for the halftime show at the 2010 Homecoming football game. “Allee Willis Marches on Detroit!” is a dream come true for Allee, connecting her songs and The Color Purple to Mumford and her beloved hometown of Detroit—all in the city’s most famous venue. She also looks forward to working with Mumford students on an ongoing basis. And, this project builds on work Allee started doing with the school in 2008, when she was on a national radio broadcast as Mumford became the first school in the country to receive 400 hours of historic audio tapes related to African-American history that she helped to restore with Pacifica Radio Archives. FYI “Allee Willis Marches on Detroit!” takes place just before a matinee of The Color Purple. Event tickets do not include admission to the show. Attendees may (but are not required to) separately purchase discounted tickets for The Color Purple—in advance—by calling group sales at the Fox Theatre. “Allee Willis Marches on Detroit!” is supported by Nickelodeon’s The Big Help Grant Program.